I was really excited when I saw the swatches online (namely the Polishaholic's) for the Disneys Oz The Great and Powerful Collection for OPI. I knew that Lights Of Emerald City was the shade that stood out to me those most. In fact I think I told my housemate and I quote "THIS NAIL POLISH IS SO ME!". It's a clear polished packed full of large matte square glitter and smaller iridescent square glitter particles which shimmer both gold and silver. 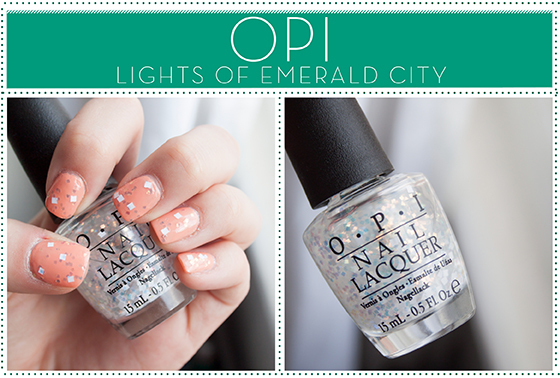 It's super girly, sugar fairy princess topcoat for nails. While the glitter is spot on for what I like, I think it's so unique and very indie polish inspired. I think It's difficult to work with, its easy to get out the smaller flakes but the square particles are a little harder to fish out. It's more of a chore than impossible to work with… The larger bits tend to drag along the nail and settle at the tip of the nail so you have to blob them on, but then in turn it's adding more liquid to the nail making it have a longer dry down time. I feel the same about this OPI polish as I felt about the OPI Nothin' Mouse about it Polish. While unique and really different, It just takes a ridiculous ammount of time to dry when layered over other polishes. I love the way it looks but I just feel so underwelmed by it's dry down time and difficulty to apply. Lights Of Emerlad City is my stand out shade from the whole OPI Oz The Great and Powerful Collection, but I just wish it dried better and wasn't such a faff to apply. I just find it just annoying for a premium polish to take forever to dry. I bought this from Amazon for £8.49 including postage which I didn't think was too bad. It's still in my acceptable nail polish price bracket!